We’d love your help. Let us know what’s wrong with this preview of The Predictioneer's Game by Bruce Bueno de Mesquita. Bruce Bueno de Mesquita is a master of game theory, which is a fancy label for a simple idea: People compete, and they always do what they think is in their own best interest. Bueno de Mesquita uses game theory and its insights into human behavior to predict and even engineer political, financial, and personal events. His forecasts, which have been employed by everyone fro Bruce Bueno de Mesquita is a master of game theory, which is a fancy label for a simple idea: People compete, and they always do what they think is in their own best interest. Bueno de Mesquita uses game theory and its insights into human behavior to predict and even engineer political, financial, and personal events. His forecasts, which have been employed by everyone from the CIA to major business firms, have an amazing 90 percent accuracy rate, and in this dazzling and revelatory book he shares his startling methods and lets you play along in a range of high-stakes negotiations and conflicts. To ask other readers questions about The Predictioneer's Game, please sign up. This guy declares that everyone is an egotist. Nothing very earth shattering there. Then he sets about proving it by name dropping all the important people who have seen fit to pay him money to solve problems. One gets the feeling that he's missed out on the cottage industry of pop prognostication that has sprung up in recent years (he even mentions how Nate Silver is the son of an old friend) and is desperately trying to get some street cred. It's as if the dad from Leave It To Beaver got on the Internet and started LOL-ing inappropriately and telling you how the intransigent geopolitical quandaries of the age are no different from haggling over the price of a new car with a cynical, albeit perfumed, salesman. My estimation is that it's a clumsy book, but I'm sure he forecasted a certain amount of disappointment with startling accuracy. Li este livro por conta do The Dictator's Handbook: Why Bad Behavior is Almost Always Good Politics, que me impressionou muito. O Bruce Bueno De Mesquita trabalha com teoria dos jogos e predição e nesse livro explica como faz isso. Dá uma passada por cima (e uma atualizada) em teoria dos jogos e explica como formula as pequenas perguntas que usa para responder as grandes perguntas, como as chances de um país entrar em guerra com outro. Vi muita ressonância com o que o Superforecasting: The Art a Li este livro por conta do The Dictator's Handbook: Why Bad Behavior is Almost Always Good Politics, que me impressionou muito. O Bruce Bueno De Mesquita trabalha com teoria dos jogos e predição e nesse livro explica como faz isso. Dá uma passada por cima (e uma atualizada) em teoria dos jogos e explica como formula as pequenas perguntas que usa para responder as grandes perguntas, como as chances de um país entrar em guerra com outro. Vi muita ressonância com o que o Superforecasting: The Art and Science of Prediction descreve sobre pessoas que realmente sabem predizer situações. کتابی سرشار از کلیگویی، داده (و نه دانش!) و شرح ما وقع بدون اینکه اطلاعات دقیق و جزئیای درباره عنوان و موضوع کتاب داده شود! کتابی سرشار از کلی‌گویی، داده (و نه دانش!) و شرح ما وقع بدون اینکه اطلاعات دقیق و جزئی‌ای درباره عنوان و موضوع کتاب داده شود! De Mesquita's book is on the whole quite interesting, but ultimately very frustrating as well. The essential idea is that he has created a computer model that simulates the interactions of multiple agents to predict the likelihood and form of an outcome. The basic form of the simulation is an iterated and evolving game. The inputs to the model are, apparently, purely quantitative representations of various attributes of those agents, including influence, salience and preferred outcome; the logic De Mesquita's book is on the whole quite interesting, but ultimately very frustrating as well. The essential idea is that he has created a computer model that simulates the interactions of multiple agents to predict the likelihood and form of an outcome. The basic form of the simulation is an iterated and evolving game. The inputs to the model are, apparently, purely quantitative representations of various attributes of those agents, including influence, salience and preferred outcome; the logic of the model is derived from game theory and rational choice theory. What makes this intriguing is that De Mesquita's consulting firm apparently has had some signal successes with his predictions. He isn't shy about pointing to a CIA assessment giving him a 90 percent accuracy rate. More interesting, to me, is that he reports taking his model into the classroom of a skeptical professor and working the students through several analyses. Since those students provided the inputs and monitored the use of the model, it seems unlikely that it was being tweaked by its author — and since the model was used to successfully (at least according to the author) predict events several months in the future, its legitimacy is boosted. The frustration of the book is that the model is proprietary, and De Mesquita provides practically no information regarding how it works. And its predictive powers as well as some of the details revealed should certainly raise skeptical eyebrows. First, the idea that complex negotiations and interactions can be reduced to simple numbers is tenuous itself. For example, he apparently believes that China's relative influence in negotiations over the regulation of greenhouse gases is 15, compared to the EU's influence of 87. Nuance and complexity are both elided. Even if numbers can do the job, there is a big problem with knowing which numbers to include and which to ignore. Chapter 8 somewhat deals with this, when he acknowledges that his analysis of the Clinton health care effort came out completely wrong — because he included the House Ways and Means Committee chairman Dan Rostenkowski, who then went on to get himself indicted and convicted on corruption charges. If that actor had been left out of the equations, we are told the model would have done just fine. The larger problem is that the modeler must explicitly choose beforehand what to include in the model, and any exogenous effects cannot be known of until they become salient. De Mesquita seems to be implicitly arguing that history is effectively convergent: as long as there is no "earthquake", an analysis that includes only trivial representations of the most major agents involved will still usually be correct. As an example of how flawed this might be, consider his presentation of his analysis of the U.S.-Soviet Cold War. Using only data that was known in 1948, he set up multiple somewhat randomized simulations of the following fifty years. On the face of it, his results are deliciously plausible: in 78 percent of the simulations, the United States emerged the sole superpower at some point during those fifty years; in 11 percent, the Soviet Union emerged the victor, and in 11 percent the conflict continued. But if you put numbers into the model, how is it going to create the answer that some specific organization or coalition was formed? Only by programming the question into the model. But that adds another set of variables, doesn't it? Which questions should be asked, and how do we interpret the numeric outcomes to mean which answers? The idea that the future could be predicted and even shaped is tantalizing, but such a bold claim requires much more detailed evidence than De Mesquita is willing to offer about his treasured model. P.S. : oddly, one of the more intriguing discussions in the book is a game-theoretic analysis of the decline of the Catholic Church's political hegemony after the Concordat of Worms in 1122. For those that do choose to read the book, this is a delightful tidbit in the final chapter. Looks at an application of game theory for predicting the future of business and political negotiations. The model relies on political or business experts to identify specific issues, their possible outcomes, and the key players. Players are the people who influence a negotiation or decision. Experts are asked to answer narrow questions about which outcome each player would prefer, how important the issue is to each player, and how much influence each player can exert. The model simulates a numb Looks at an application of game theory for predicting the future of business and political negotiations. The model relies on political or business experts to identify specific issues, their possible outcomes, and the key players. Players are the people who influence a negotiation or decision. Experts are asked to answer narrow questions about which outcome each player would prefer, how important the issue is to each player, and how much influence each player can exert. The model simulates a number of rounds of a game. At each round, players make proposals to one or more of the other players and reject or accept proposals made to them. Through this process, the players learn about one another and adapt their future proposals accordingly. Each player incurs a small cost for making a proposal. Once the accepted proposals are good enough that no player is willing to go to the trouble to make another proposal, the game ends. The accepted proposals are the predicted outcome. The model doesn't directly take into account the history of the issue, the cultural norms of the area, or what the experts think will happen. The basic assumption is that people make choices based on their own self interest, which for political and business leaders means maintaining their jobs and/or influence for as long as possible. Too much ego, not enough detail. Bueno de Mesquita is a leading game theorist among political scientists and this book attempts to introduce the layman to the logic of self-interested behavior. The beginning of this book is pretty effective. The first few chapters use everyday examples to illustrate basic concepts in game theory. Readers are led to believe that they will learn how to apply some concepts from game theory to their own lives. Had the book continued this way, it would have been very good. Unfortunately, the last 2/ Bueno de Mesquita is a leading game theorist among political scientists and this book attempts to introduce the layman to the logic of self-interested behavior. The beginning of this book is pretty effective. The first few chapters use everyday examples to illustrate basic concepts in game theory. Readers are led to believe that they will learn how to apply some concepts from game theory to their own lives. Had the book continued this way, it would have been very good. Unfortunately, the last 2/3 of the book is a very long list of Bueno de Mesquita's favorite personal accomplishments. Applications to everyday behavior fade as the author spends more and more time recounting his own past projects. I like the idea behind the book, but it was not executed well. This book introduces applications of an applied game theory modeling on political events. Some parts are very interesting and inspiring, some parts are not too relevant for my lack of interest in the events themselves. This is the third book of the same author who wrote The Logic of Political Survival, The Dictator's Handbook, and this one. I'm going to read The Logic of Political Survival soon. I don't know that I'll ever actually read this, but there was an interesting article about this guy in the NYT about using game theory to predict whether (or when, actually) Iran will build an atomic bomb. This book has aged poorly in the ten years since its publication. De Mesquita’s claim-to-fame is that he constructed "successful" game theory models for several intelligence agencies. I expected that a well-published academic like this would write something more along the lines of Judea Pearl's The Book of Why, which omitted most of the mathematical content, yet retained a lot of rich conceptual structure that provided useful ideas to the reader. Though Pearl’s graphical models may well lend the This book has aged poorly in the ten years since its publication. De Mesquita’s claim-to-fame is that he constructed "successful" game theory models for several intelligence agencies. I expected that a well-published academic like this would write something more along the lines of Judea Pearl's The Book of Why, which omitted most of the mathematical content, yet retained a lot of rich conceptual structure that provided useful ideas to the reader. Though Pearl’s graphical models may well lend themselves best towards visual thinking, while de Mesquita’s does not, what we have in The Predictioneers Game are brief outlines of several historical scenarios as well as others that were timely as of the public ation date. The author has applied his game theoretic reasoning but provides no real specification of the underlying model that he presumably leveraged, which stands in contrast to Pearl’s work where the model is explained in some conceptual detail. The book makes reference to game trees several times, though no actual trees were depicted. A depiction of the trees would have helped, but even then such games are highly dependent on the payoffs presumed for each actor and how they relate to his or her moves; the problem is that specifying these payoffs and their relation to each actor’s moves seems arbitrary. It may well be that the author didn't feel this actually critical step in his model construction was relevant for the target audience. Either way, the result is that an informed reader of some technical acumen will likely find the analysis unconvincing. It doesn't help to instill confidence in the savvy reader that de Mesquita opens the book with a scenario he claims to be profound and revealing but that ends up being nothing of the sort. The opening pages cover tactics for negotiating a better deal on a new car, but the solution ends up being a technically trivial and unsurprising resolution to the scenario. In fact, the strategy he promotes, to call dealerships and solicit bids on cars by revealing the current minimum one has gotten from other dealers, is one that a relative of mine has employed for years. This same relative never went beyond a high school education and came up with the strategy as a matter of common sense. Though game theorists and economists would likely respond to these critiques with a variation on the "as-if" argument, the author fails in his opening pages to convince the reader that the mechanics of his models will reveal anything profound. Other scenarios provided, such as predicting an Iran-Iraq entente upon the withdraw of US forces from Iraq were foreseen in the pages of Foreign Affairs, just prior and during the second Iraq War (no fancy model needed), some six to seven years before this book was written. Another big case-study, predicting both World War I and the path of the Cold War were problematic. In both cases the author's analysis depends upon identifying all relevant actors within and between the European states in question, knowing their incentive structure correctly, correctly identifying maps onto some domain for his model parameters, then executing the simulation (hoping no one component is particularly ill-posed and will blow up or shrink up some critical set of parameters that would degenerate his end-result). How the author built this particular model would be interesting commentary but no such explanation was provided. Instead, we get an interesting, but totally achievable by non-technical means, analysis of the move and counter-move that informed the start of World War I. There's a similar study provided for the Cold War, wherein the author tries to answer the question of whether that conflict could have been concluded successfully much earlier. Some interesting moments; best in the analysis of historical scenarios and for some of the rather dramatic anecdotes the author includes. However. If techno-utopianism and Silicon-Valley type "the algorithm is God" optimism irritates you, this is going to as well. The author is not as smart as he likes to think he is and is regularly guilty of blurring the lines between the mathematical predictions of his model and the interpretation of the numbers (which is often better with hindsight). An inter Some interesting moments; best in the analysis of historical scenarios and for some of the rather dramatic anecdotes the author includes. هذا كتاب لعشاق نظرية الالعاب مثلي حيث استخدم " دي مسكيتا" نظرية الالعاب لعمل نموذج للسلوك البشري يتوقع به المستقبل، و يحسّن نظام الحوافز. و لقد استهل الكتاب بشرح نظرية الالعاب بشقيها " التعاونية" و التنافسية، و قام بتطبيقها من خلال نموذج أعده مكتبه الاستشاري على الكثير من الوقائع السياسية و الاجتماعية ، و الشركات، و توصل الى نتائج باهرة. هو كتاب ممتع نسبيا يدفعك الى القراءة بنهم في نظرية الالعاب ، و ان عابه بشكل نغص علي متعتي إحساسك ان الكاتب يروج لشركته ، وان ما تقرأه هو كتيب إعلاني . Không phải là một tự sách thường thức phù hợp cho hầu hết mọi người, mà là một cuốn sách diễn bày về một phương pháp giúp dự đoán các sự kiện kinh tế, chính trị, hoặc có thể áp dụng cho các lĩnh vực khác dứa trên các sự kiện đã diễn ra, các yếu tố hiện tại cân đo đong đếm để dự đoán. Tuy nhiên trong cuốn sách vẫn còn khá chung chung, chưa cụ thể và chi tiết ứng dụng vào một tình huống thực tế để những người nghiên cứu có thể áp dụng. I was expecting a book about game theory. And when the author introduced himself as an academic, I expected more formal explanation of the theory and more, well, beef. I ended up reading a very shallow superficial book about the topic full of stories and loads of bla-bloody-bla, and at some parts I even asked myself if I am reading a book or the author's resumé. A very accessible discussion of game theory. It's a bit dated but easy to read and a great introduction to the topic. worth to read by those who are in politics and finance. Bruce is one of my favorite authors and his predictions have turned out to be true in most of the cases. Reading this book for a graduate social work class, to learn how to use game theory to understand and shape how power moves in service to social justice causes, was fascinating. A few of the chapters lived up to my hopes for the book, but several were disappointing. Using game theory to predict behavior is a fascinating topic, in my opinion. The book had a strong opening as he explained some of the basics of game theory and applied it to some real life situations. He then began to explain how his prediction model worked, but after talking about how he gets information from experts about certain questions, this ends abruptly. I was hoping to learn a little more about his A few of the chapters lived up to my hopes for the book, but several were disappointing. Using game theory to predict behavior is a fascinating topic, in my opinion. The book had a strong opening as he explained some of the basics of game theory and applied it to some real life situations. He then began to explain how his prediction model worked, but after talking about how he gets information from experts about certain questions, this ends abruptly. I was hoping to learn a little more about his method of prediction, but this method remains a black box throughout the book and the remainder of the book deals with examples of how this technique has been used. Certainly, some of the examples are interesting. I liked learning about his technique of engineering outcomes in negotiations, and how changing behavior in a negotiation could lead to better results. One of his examples in this area was fairly ridiculous, though. He gave an example of choosing a replacement for a CEO and how he was able to get a company to change its voting technique in order to get a certain CEO elected. The method he convinced the company to use was so absurd that I am shocked that anyone with half a brain agreed to use it. The method was incredibly biased to get a certain candidate chosen and I don't know why the rest of the candidates couldn't have seen that. Some other examples were good, though they were obviously cherry-picked to make his method seem more impressive than it really is. He has a chapter devoted to failed predictions, then really only brings up one of them and has a big excuse as to why it didn't work out. There's no way a method like this has nearly as much predictive power as he claims. I looked into his claim that the CIA said he had a 90% success rate and they were really only saying that he has approximately the same success rate as experts over a very limited sample set (not as impressive as the way he puts it). I've been meaning to read this book since it came out in 2009 (I think?) & couldn't have enjoyed it more. In it, political scientist Bruce Bueno De Mesquita discusses how he's spent the last thirty-some-odd years harnessing the power of math & logic (in the form of game theory) to make spookily accurate predictions about business, politics, legal battles, & all kinds of other situations that involve human beings negotiating and scheming for the best outcome possible. Even more impres I've been meaning to read this book since it came out in 2009 (I think?) & couldn't have enjoyed it more. In it, political scientist Bruce Bueno De Mesquita discusses how he's spent the last thirty-some-odd years harnessing the power of math & logic (in the form of game theory) to make spookily accurate predictions about business, politics, legal battles, & all kinds of other situations that involve human beings negotiating and scheming for the best outcome possible. Even more impressive, these aren't fields in which he has any particular expertise or access to privileged information--as he reminds us over and over and over again, humans who want things are predictable, which means their behavior can be modeled mathematically. Once you know just a few things about all the major players (level of influence, desired outcome, how much credit they want, how committed to/flexible they are regarding their desired outcome, & whether they have veto power in the situation), it's just a matter of quantifying those things, feeding the values into the model, & interpreting the results. Impossible, you say? That must be why Bueno De Mesquita's predictions have had something like a 90% success rate over the course of his career. I also enjoyed the part where BDM engaged in a bit of retroactive predictioneering--ie, using only his prediction model & information widely available at the time to show that both the Cold War & its resolution were basically preordained at the end of World War II, that Britain likely could've prevented WWI, and Sparta might have survived but for its addiction to horse racing. It was also neat to see that predictions he & his students made in the last chapter using the model (the failure of the Copenhagen Conference to do anything about global warming, & the US upping aid to Pakistan to $1.5 billion being enough to get them to stop making side deals with the Taliban Al Qaeda, but not to squash them completely) have come to pass since the book was written in '09. 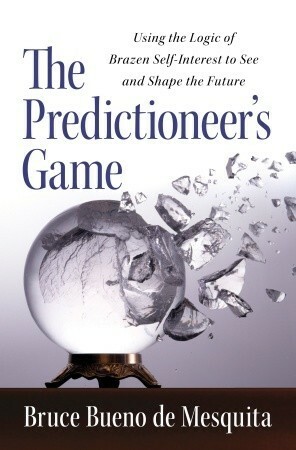 The Predictioneer's Game is an intriguing book about how political scientist and consultant Bruce Bueno de Mesquita has used game theory to build proprietary computer models to predict and even engineer events. The book starts accessibly with an introduction to game theory and an example of how the author applies it to buying a car. The rest of the book is three threads woven together. One is stories of how Bueno de Mesquita used his models to help a corporation's executives get out of severe cr The Predictioneer's Game is an intriguing book about how political scientist and consultant Bruce Bueno de Mesquita has used game theory to build proprietary computer models to predict and even engineer events. I found the first three or four chapters of this book were incredibly engaging and easy to read. My knowledge of game theory improved greatly while reading this book. That said, as it progressed, I found the text to be more and more dry, making it difficult to get through. A good read, but it definitely requires patience. ISBN 1400067871 - The first, and only, prediction I'd make on this book is that most readers will be way geekier than I. And I totally mean that in a good, awestruck, way because - you've surely noticed by now - geeks run the world and I don't. Given (some of) the (extraordinarily) lengthy (long-winded...) reviews on this book (which scared me away from reading the book for a while), I'm going to forego any real recap of the book. If you haven't bothered to read any of the more verbose reviews, m ISBN 1400067871 - The first, and only, prediction I'd make on this book is that most readers will be way geekier than I. And I totally mean that in a good, awestruck, way because - you've surely noticed by now - geeks run the world and I don't. Given (some of) the (extraordinarily) lengthy (long-winded...) reviews on this book (which scared me away from reading the book for a while), I'm going to forego any real recap of the book. If you haven't bothered to read any of the more verbose reviews, my short recap: You know the TV show Numbers? This book and that show have two things in common - the use of game theory and I like both for the same reason, because they're over my head 80% of the time but strive not to be. Beyond that, one's a TV show with all kinds of stunningly unlikely events and the book is real, so they go their separate ways pretty early on when you compare them. If you're like me and tend to let your eyes glaze over when math is the topic, you'll probably find yourself surprised by The Predictioneer's Game. I picked it up because my son is a math geek studying accounting and I can't help but think that there's got to be more interesting things to do with numbers. In my opinion, this book proves me right! Best of all, it's written in a way that is accessible to even the least math-adept amongst us, so it's got a broader appeal than I expected. There were a few glazy-eyed moments for me, but that's more an attention span issue than anything else and I feel comfortable recommending this one to anyone (especially my son!). Everyone interested in politics needs to read this book. Several researches has shown that general population in developed countries do not behave entirely according to the game theory and they also conclude that the more level of country development is the less pure self-interests affect people behavior. Well, apparently complex selfishness behavior is not a true case at all for large category of people and especially it is not true for politicians and businessmen. You probably always suspected Everyone interested in politics needs to read this book. Well, apparently complex selfishness behavior is not a true case at all for large category of people and especially it is not true for politicians and businessmen. You probably always suspected that, right? At least businessmen never deny they optimize self-interest, but politicians are entirely different breed. They always tell us how selfless they are and how they fight 7/24 for "national interests". Nevertheless when author use game theory on them - the theory where each player only optimize its own well being - the results are astonishing. Just a simple assumption that every politician on this Earth is selfish meanie opens a brilliant opportunity to predict their behavior in the past and in the future. Yes, the book you about to read is all about future prediction - mostly in politics. And it comes from the guy who predicts this future with unbelievable 90% accuracy. Using just pure math and very unflattering point of view of us, humans. Do not worry about math, though, author is keen enough to use just old plain English. I like the cover. It's pretty. I know that's not important, and will likely change with future editions of the book, but still... I said it. This is the second of Bueno De Mesquita's books that I've read. I definitely appreciate that he attempted to make something more approachable to people with little-to-no background in political science (yup, that's me). But one of his ideas of "approachable" seems to be "witty," which I am of the opinion BDM is not. As an introduction to the concepts of his I like the cover. It's pretty. I know that's not important, and will likely change with future editions of the book, but still... I said it. But one of his ideas of "approachable" seems to be "witty," which I am of the opinion BDM is not. As an introduction to the concepts of his method of prediction, I thought Preditioneer's Game worked overall, but his attempts at humor fell flat. Not even thick enough for a pancake flat. They didn't make me more comfortable with the book and the concepts he presented. They made me want to cover my eyes and shake my head, which is not, by the way, an effective reading strategy.